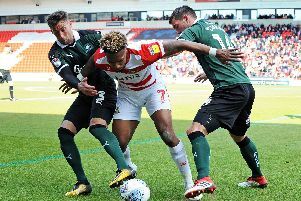 Paul Dickov says ‘an old school mentality’ has helped Doncaster move through the gears. Rovers’ only defeat in their last eight games came at the hands of League One high fliers Bristol City in the FA Cup. And Dickov says his squad’s attitude has been key to that run of form. “I hate trying to sound clever, but we knew that we could struggle in the early part of the season because of the personnel changes and people not being fit, as in not having a pre-season,” said Dickov. “If we had any injuries or suspensions we were going to struggle because the squad was light. “We’ve got everybody fit at the moment. “The most pleasing thing for me as manager at the minute is the team spirit and togetherness that the lads have got, and I think that’s been there for every one to see over the last month or so. “Whoever’s coming on as substitute at the moment, or whoever is left out, their attitude has been outstanding. They’re all backing each other. “There’s nobody spitting their dummy out, which tends to happen a lot with footballers these days. “There’s a little bit of an old school mentality about the squad at the moment, which I like. “They all know what’s expected of them and they’re demanding a lot more of themselves and their teammates,” he added.